Blowout Sale! 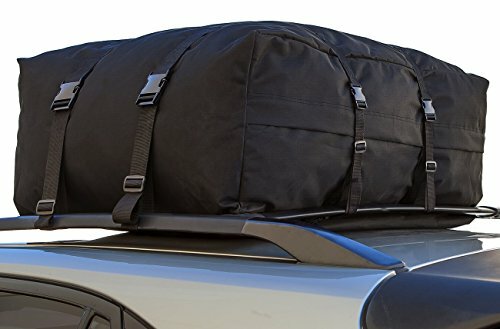 Save 79% on the OxGord Car Van Suv Roof Top Cargo Rack Carrier Bag Soft-Sided Waterproof Luggage for Rooftop - 10 Cubic Feet by OxGord at Our DXC. MPN: CARC-1143-GY-NEW. Hurry! Limited time offer. Offer valid only while supplies last. This easy to install and remove cargo carrier bag provides additional space to any vehicle with roof rack side rails, crossbars or cargo baskets. This easy to install and remove cargo carrier bag provides additional space to any vehicle with roof rack side rails, crossbars or cargo baskets. Easily set up and secure the carrier bag with clips and straps. Because the carrier is frame-less, it easily folds up when not in use. Stowing gear in this carrier will provide much needed elbow room. It will also make your rear view mirror usable again, or if nothing else, let you cram even more stuff into your vehicle. It's a great accessory for camping, road trips, and stinky sporting equipment. Oh, and its waterproof! It will always protect your precious goods, rain or shine. The cargo carrier bag opens with Dual Zippers, and attaches with eight (8) adjustable straps, two (2) per side. DIMENSIONS: 32" (L) x 31.5" (W) x 11" (H) Inches. TRAVEL READY Rooftop Soft-Sided Cargo Carrier with zipper enclosure to keep all your belongings in place and heavy duty buckle straps secures the carrier to your vehicle. MATERIALS: Made of durable and water-resistant materials to withstand tough weathers. COMPATIBLE with all vehicles that has a roof rack. Simple installation, no tools required. Simply buckle the cargo carrier to your roof rack and adjust the straps to tighten it. Made by a trusted brand OxGord.